Google has announced what looks to be a direct competitor to the Microsoft Surface family: the Google Pixelbook. Touted as a high-performance, two-in-one Chromebook, the Pixelbook is Google’s thinnest laptop thus far, measuring just 10.3mm thick, and it weighs in at a mere 1.1kg. Materials are distinctly premium too, as you get an aluminium unibody chassis coupled with Corning Gorilla Glass. 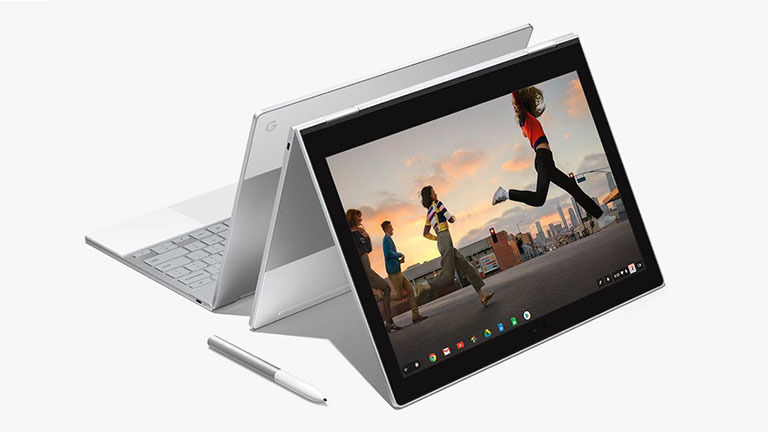 The Pixelbook sports a 12.3in touchscreen display with a 2,400 x 1,600 resolution (3:2 aspect ratio), which equates to 235ppi. The screen isn’t detachable, but a 360-degree hinge allows you to rotate it and use the device in tablet mode. The new laptop looks like it will pack a fair bunch in terms of hardware, as well. Starting with the entry-level £999 model, we have an Intel 7th-gen Core i5 Y-Series CPU paired with 8GB of RAM and 128GB of eMMC storage. An extra £200 nets you the mid-range Pixelbook which upgrade the storage to 256GB, while a whopping £1,699 is needed for the flagship Pixelbook, where the CPU is switched to an Intel 7th-gen Core i7 Y-Series model, the RAM is bumped to 16GB, and storage becomes a 512GB NVMe SSD. All Pixelbooks also have dedicated security hardware, too. The expense doesn’t necessarily stop there, as Google has also announced the accompanying Pixelbook Pen, which will be sold separately for £99. Said to be virtually lag-free (claimed 10ms latency), the stylus is pressure-sensitive through 2,000 levels and supports tilt functions through 60 degrees. Battery life is claimed to be up to 10 hours, and Google also claims the unit can charge fast enough to allow for two hours’ use from a 15-minute charge. Charging happens via one of the two onboard USB Type-C ports. The only other port is a standard 3.5mm headphone jack; there is no SD card reader. The two lower-end Pixelbook models and the Pixelbook Pen can be pre-ordered now and should be shipping from Novemeber 1. The flagship unit is listed as ‘coming soon’; those interested can join a waiting list. More details are available on the official product page. Correct me if I'm wrong, but why would you need such a powerful and expensive chromebook? It's not like Chrome OS is a full blown OS and it actually needs that much power or it has the apps and tools that Windows or Mac has. Also considering you can get equivalent performance from your average £350 chromebook, this makes no sense. Most of Chrome OS apps run off the cloud so I'm seeing this as pointless. Rather spend a bit more and get a Surface Pro instead. It's a low volume device, Google don't make many or expect to sell many but in it's third generation there is a desire at Google to make these kind of prestige computers. Chrome OS may not be a Windows or OSX competitor yet but it will be in the future sooner rather than later. A bit more?! Seriously? Top Chrome book is 1699£ and the surface pro is 2149£. This results in 450£ of difference, meaning a 25% more expensive machine. a whopping £1,699 for a gadget that can only render Excel sheets and low fps 4K videos… can it manage anything more on the intel HD GPU?